Black carrot people began to eat and to use as medicinal plants even during the middle Ages, mainly in the South-West of Europe. On different continents, a root vegetable called different black carrots, scorzonera, sweet or black root (not to be confused with the green hound – a poisonous plant), scorzonera, goat, sweet Spanish root, etc. Today, the vegetable is especially popular in Mediterranean countries and in America. Black carrots, or scorzonera, at the time of flowering can be identified by yellow fragrant flowers. The well-cultivated soil ripe roots can reach a length of 35 cm with a thickness of 3-4 cm. the Flesh is not dense structure of white color which contains a milky juice. The smell of the root resembles the scent of vanilla. In the wild there are many types of black carrot, but she has the taste and aroma, which has a commercial root. Examples of selection are recognized as varieties of "Russian giant", "Gigantic", "Ordinary" and "Volcano". The healing properties of black carrot primarily due to the fact that it contains large amounts of inulin, consisting of fructose. In addition, the root crop is rich in mineral composition, especially potassium, magnesium, phosphorus, calcium and iron. Black carrot a lot of protein, vitamins, including A, C, E, PP, H, K and B group, and also biologically active substances. 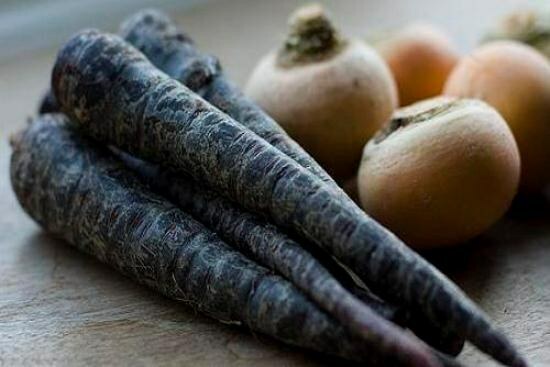 Black carrot helps to normalize metabolism, it is useful to use for people suffering from diseases of the digestive system and liver and kidneys. Carrot juice is good strengthens the immune system. Black carrots are especially popular in Tibetan and Chinese medicine. On its basis produce drugs for the treatment of diabetes, anaemia and avitaminosis. In cooking, use the roots of black carrots with an amazing vanilla scent and the foliage, which in powdered form is added to vitamin salads. Before cooking, the root is scalded in boiling water, so it was easy to remove the peel. You must then carry out the procedure of soaking within half an hour in slightly acidified water (1 tsp lemon juice to 1 liter of water), leaving an earthy taste that is present in some varieties. Housewives defending the principles of a balanced diet, put black carrots in soups, added to omelets, sauces, use as a standalone side dish to meat and fish dishes. Dried and powdered roots are good in sweet baked goods, from to make a drink that tastes like coffee, but, in contrast, allowed for hypertension and ulcer. The small circle of fresh black carrot makes vegetables crunchy and firm. To grow black carrots is no more difficult than a regular orange. It does not require machinery, cold-resistant and can even hibernate in the soil. She also does not like shaded areas and saudinet landings (must be thin). Black sow carrots early spring, late summer and winter. When spring sowing the harvest get in the first year. If to sow in August, the young shoots will normally have time to take root, to form in the second year of major roots and to successfully produce seed. Sown before winter, the carrots will germinate the following year and will yield earlier than with spring sowing. Dig root crops before frost, trying not to damage them because damaged black carrot is not stored even in comfortable conditions. The tops must be removed and the carrots to dry well. Keep the roots should be in moist sand in a vertical position at a temperature of from 0 to 1-3 OS.